Pentago was developed in Sweden: the land of Vikings, ABBA, and Ikea. Following the simplicity of design Sweden is known for, Pentago has clean lines and simple game play. In fact, it has just two play steps. First, put down a marble. Second, rotate a quadrant. Get five marbles in a row and you win. That's it. Game play may be simple, but winning can be as hard as a Viking's axe. Because you can rotate quadrants, your mind has to plan out moves in so many different directions. And just when you think you have everything thought out, your opponent rotates a quadrant and suddenly the whole board is different. 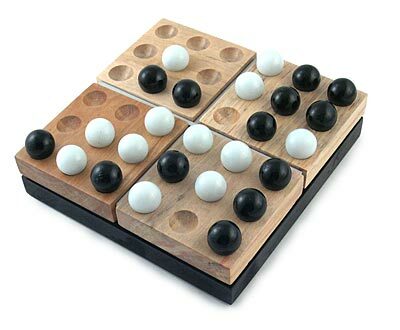 Pentago is so cerebrally challenging, it won the Mensa Select Award in 2006 (as well as a bunch of other genius and game design awards). 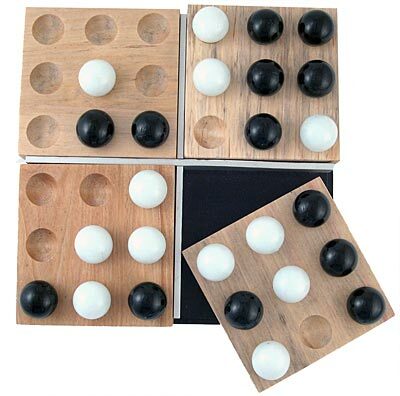 Each game board is handcrafted out of solid birch with aluminum accents and includes real glass marbles. Pentago is as beautiful as it is fun. And if you become a Pentago Master, no one will be able to deny you the title of "genius!" Board Dimensions: 5" X 5" X 1.25"
© 2014 - 2019 Kinvasoft. All rights reserved.